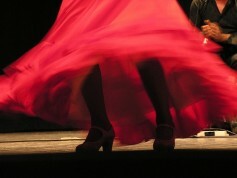 Ever thought of learning to dance “flamenco” – what better place to learn than Spain? Get a great introduction to one of the greatest of Spanish artistic traditions. You will be taken to a typical Spanish dance studio used by locals where a professional flamenco artist will take you through some of the basic ‘pasos’ of flamenco before moving on to the foot stamping, dress swishing actions of the masters! A great way to prepare for a unique night of dancing. Includes a professional instructor and private venue! Classes last for 1 hour and can be arranged for any day during daytime hours subject to availability.